You might have mistaken its historical center – called “the Sassi” – for Jerusalem in Mel Gibson’s The Passion of the Christ, or Patty Jenkins’ Themyscira in Wonder Woman. In truth, Matera doesn’t have anything to envy neither to the City of David, nor the mythical capital from DC Comics, being one of the oldest continuously inhabited cities in the world, since the 10th millennium BC. 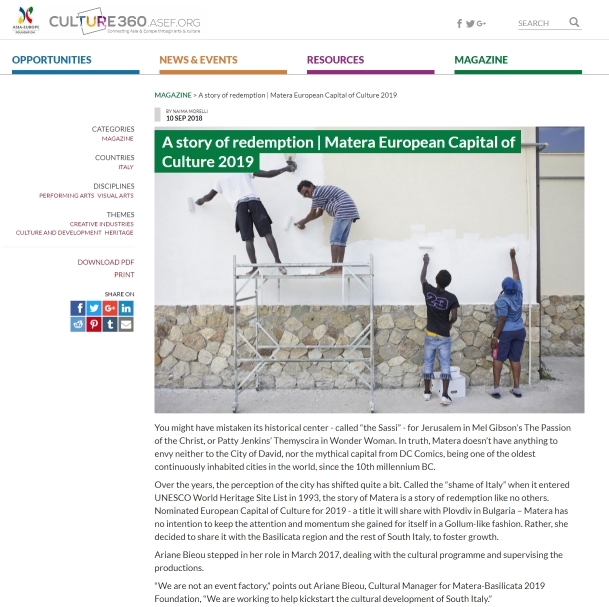 In my article for Culture360, the webmagazine of the Asia Europe Foundation I spoke with Ariane Bieou, Cultural Manger of the Foundation Matera 2019 about the program for the city as European Capital of Culture for 2019.